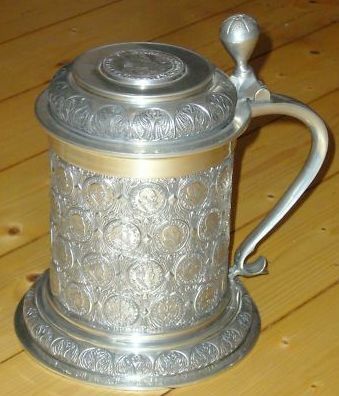 Zinnkrug – Münzhumpen 1821. (Comps. eBay’s “langorium”) I was the runner up on this one, 2-2013! 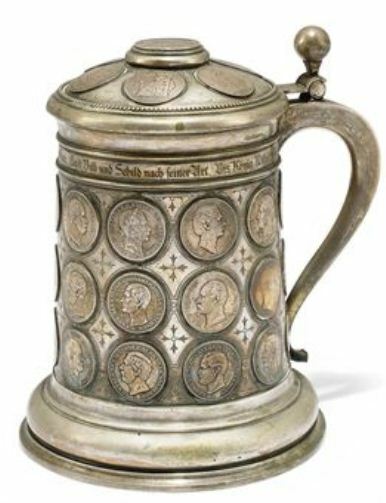 The following group of photos is merely a display of coined beer steins, called “Munzhupen” and “Muntzbechers,” or “coined beakers.” The idea behind this page is only to give the new stein collectors an overview of what may be found out there in “Stein World.” And as any new collector might surmise, the ones made of .800 or .925 silver are most expensive, but rarely over $20,000. 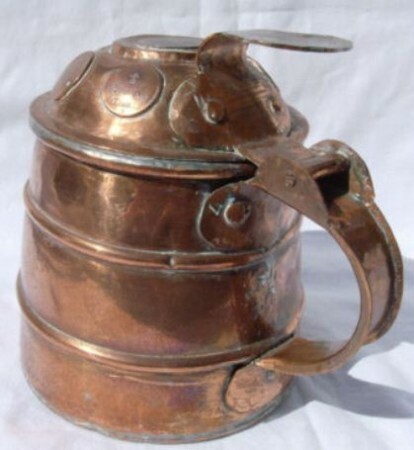 Many true pre-revolutionary Russian steins can be though. So what is there to say about this subject? 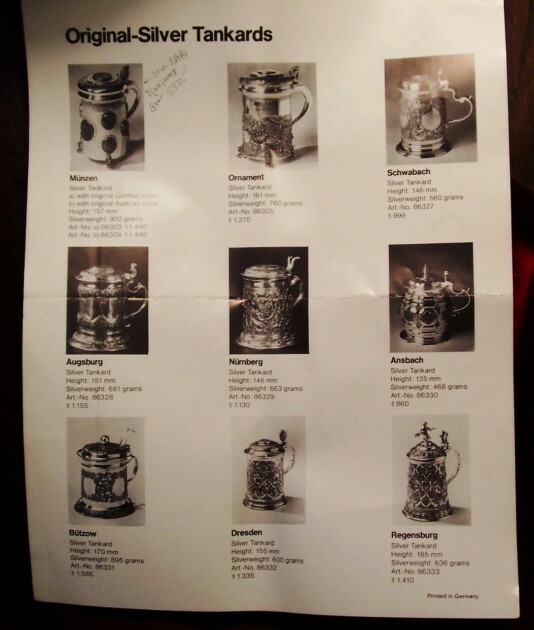 Well first these are some of the most collected category of steins in the “Antiques World” culture, not just the beer stein boys! 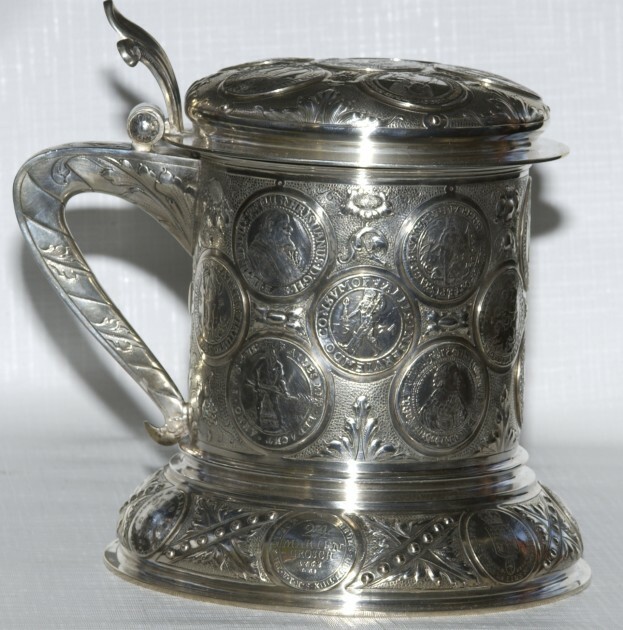 As stated above, this is most especially true of ones made out of real silver, and not “silver -plated wares”; although the prices some of the larger silver-plated (S/P) ones command is pretty unusual also (see below.) 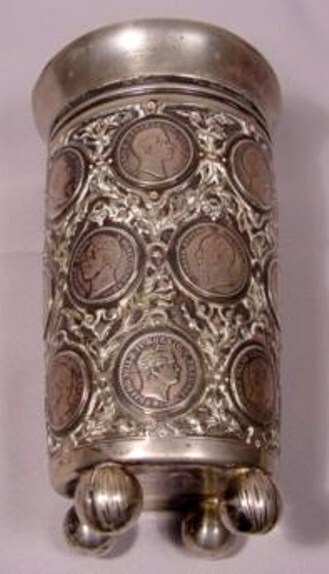 There is a lot of interest in serious coin collectors buying these, as this is an example of a “cross over” collectable. 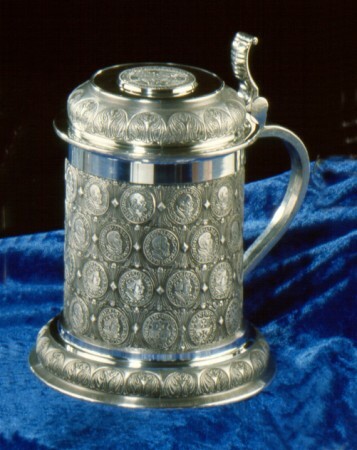 A nice silver-plated example. 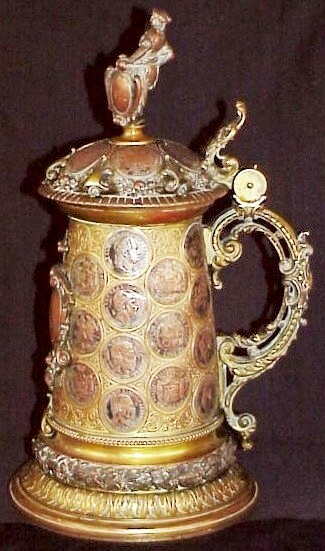 The Imperial Crown of Germany has lost its small cross on the top of the lid. This defectis found on says 30 to 50 % of the examples seen; a very vulnerable spot and most likely hit while placing the stein away. 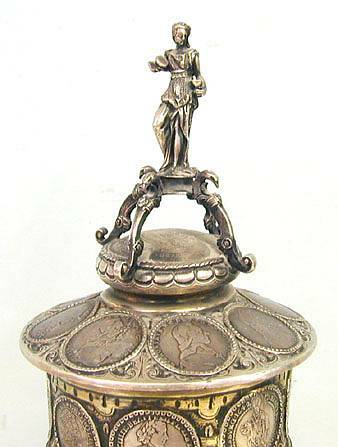 Shown below: What this piece looks like having lost most of it’s silver. 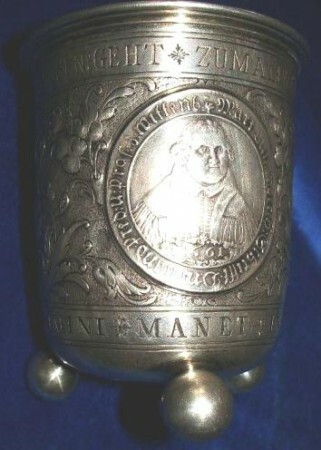 It may cost about $400-500 in today’s market to re-plate this piece. 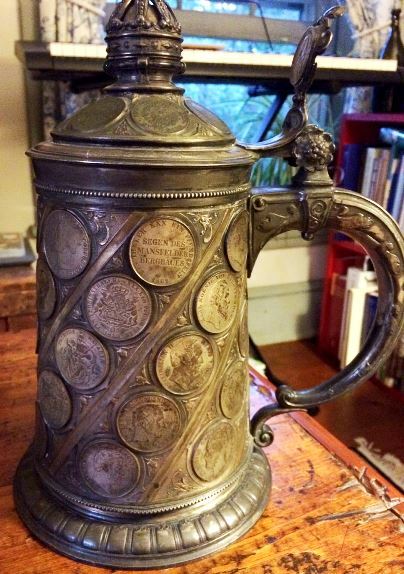 It might be cheaper to have it un-silvered and clean it up as a copper piece and display it that way. .
Just as above but without its silver plating; showing real age cracks to the copper base, bended copper tends to crack over time -n lots of examples, not just steins. 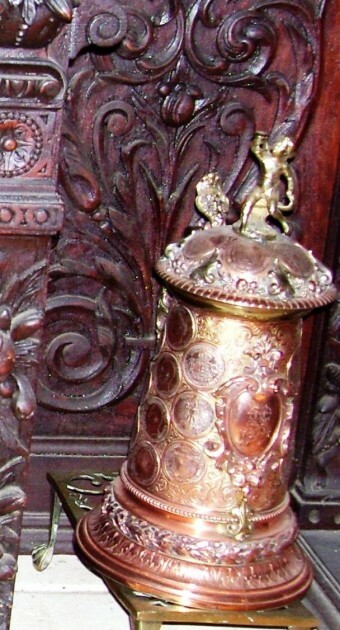 Above – a larger example checking in at 11 inches, but having lost the little cross on the top of the crown. 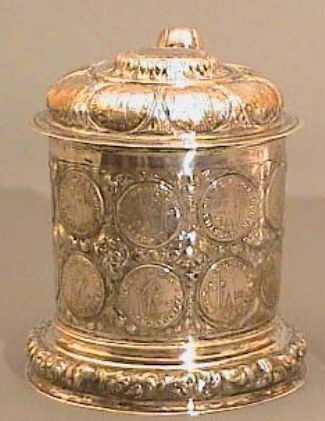 Photos of the crown and the coin in the thumblift. 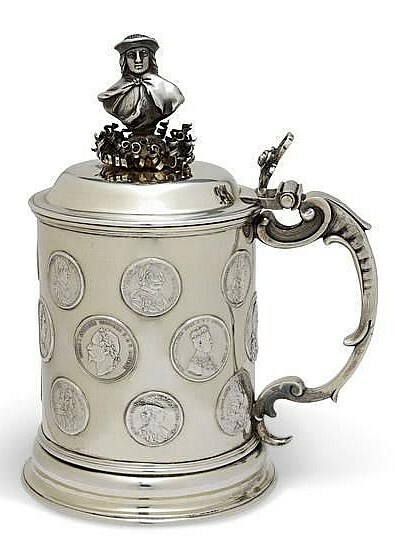 It is my observation that the rank order of popular coined pieces seems to be: [a] silver (.800 first as it was a very well liked German custom). 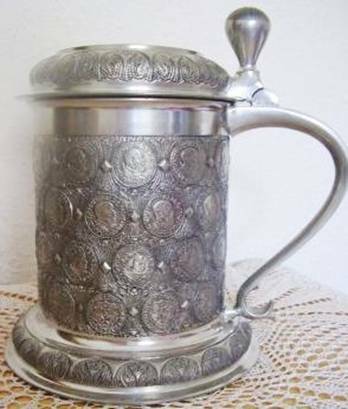 then [b] sterling , [c] pewter [the introductory photos are an example of this], [d] silver plated, then [e] real copper (not S/P that has lost it’s silver), then [f]a few miscellaneous base materials. Almost anything with real old German coins on it sells for a lot more in Germany than here in the States! 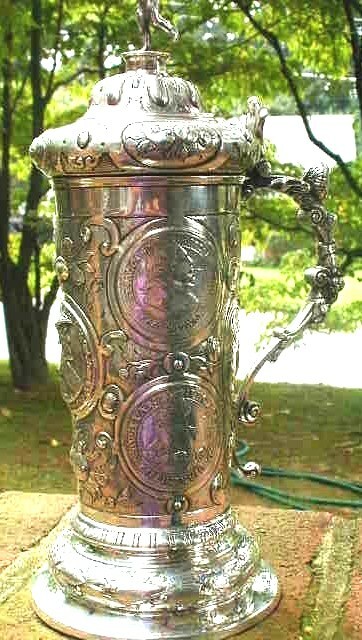 A 2L Pewter “Muntzhumpen” with “Germania” as the finial. This one is more popular in Germany than here for obvious reasons. 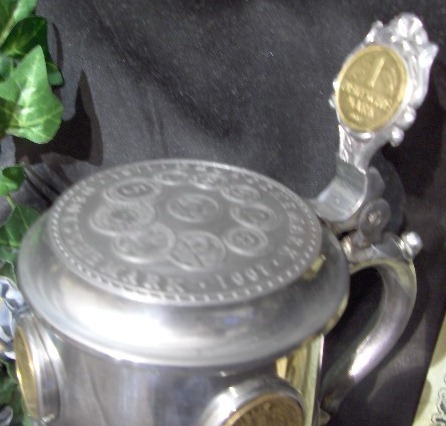 Of note here new collectors: “the coins” on silver-plated and pewter pieces are [almost] always found to be molded impressions of coins and not the real thing! Which can be very disappointing if the piece is bought at a mail bid or internet auction, and one not knowing that in advance. 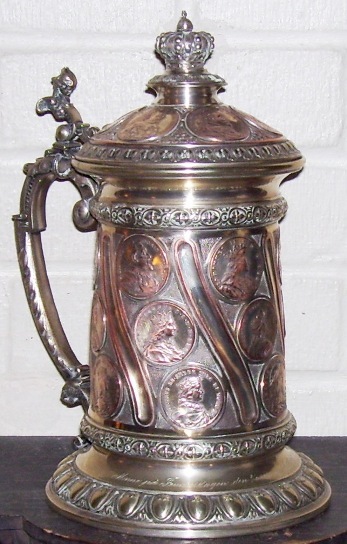 A “new” pewter stein, highly shined with “faux” coins attached. 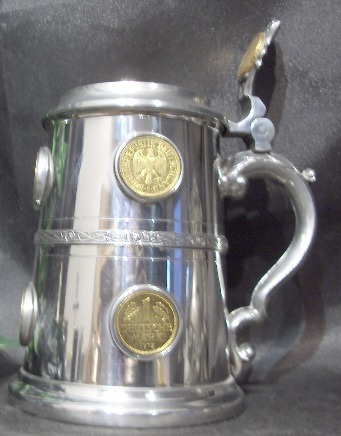 Above and below: two other much newer pewter coin steins. 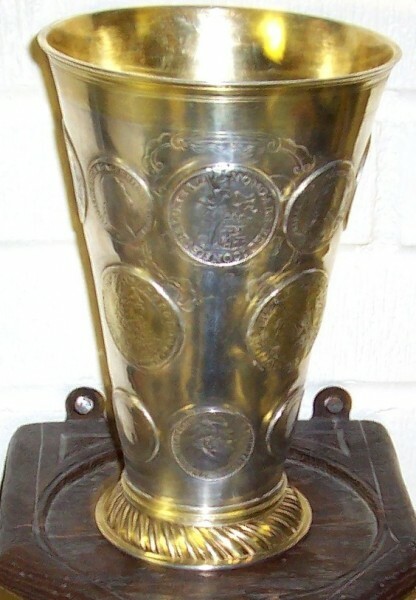 Pewter stein as above, with a wider brass band and thumblift slightly different, but the body made from the same mold. One of the latest entries into the field. 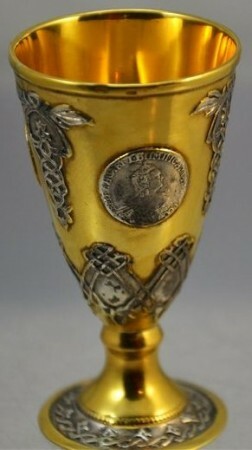 An English pewter stein with older gold plated European coins. -Seen on Germ eBay, early 2013: “Prächtiger Zinn Humpen mit Zertifikat gepunzt – Hand Crafted in Sheffield England. 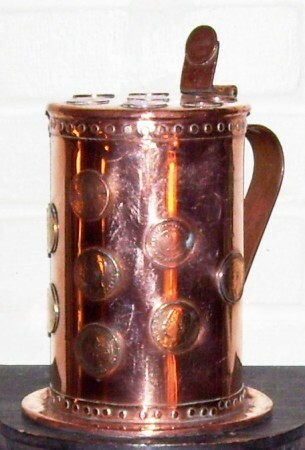 Copper; Bohemian made (the rolled edge of the handle is the give away,) mid 1800’s. 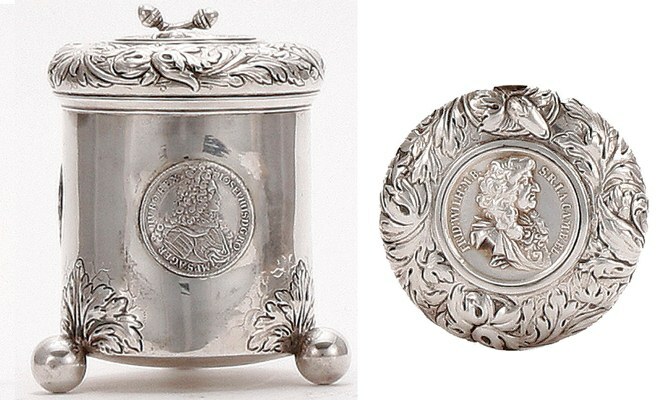 The dates of the coins, only on the lid, range from 1820 – to 1836. 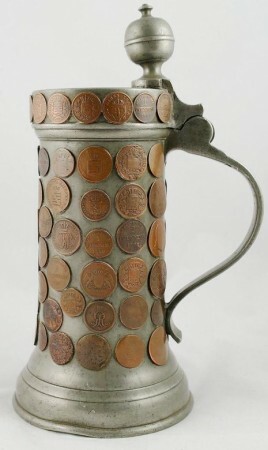 Newer coin tankard – Most likely made by the Rastels’ silver steins supplier. 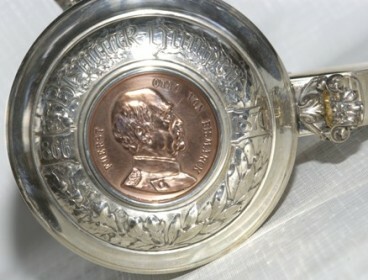 This sold for $1500.00 [+] 22.5%, at Doyle’s Auct. in NYC, 2008 or 2009. If it were truly old one might have to ad a “0” to the selling price. This seven inch beaker would not have come cheap originally either. I wish I knew more to tell you all about these two. The photo came from an on-line auction I believe. 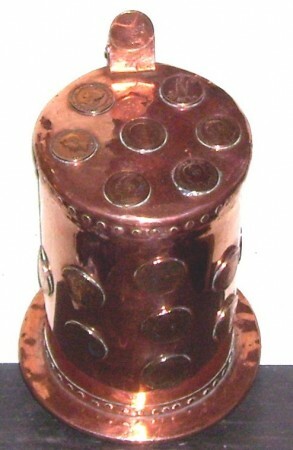 Coined beaker, 3.8 inches. 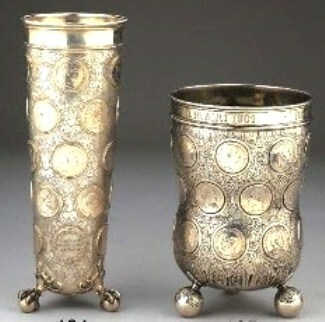 A lot of the older beakers, say the 1600’s and early 1700’s), were very tiny, given the price of silver back then. 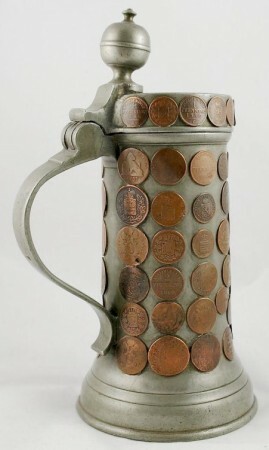 Coin beaker, early. The copper and silver coated (now worn) coins are call” billlon.” The seller wanted 600 British pound sterling back in 2005. WOW! 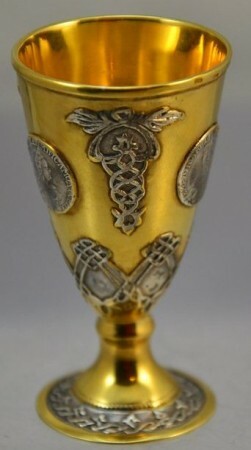 This newer, but attractive, only 2.9 inches tall, wine cup / footed beaker is being sold in Germany now. Older coins of course. 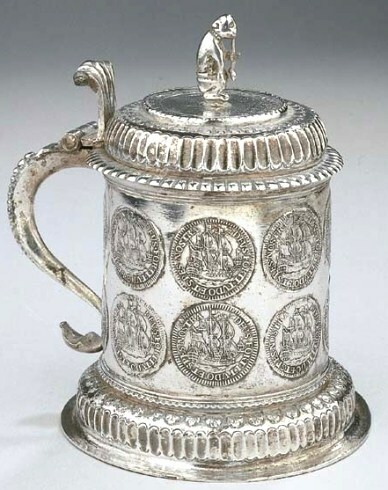 Hanau was a center of silver production in Germany that was unregulated by Guilds, therefore a “free” city that would mark and produce silver according to the demands of the market. 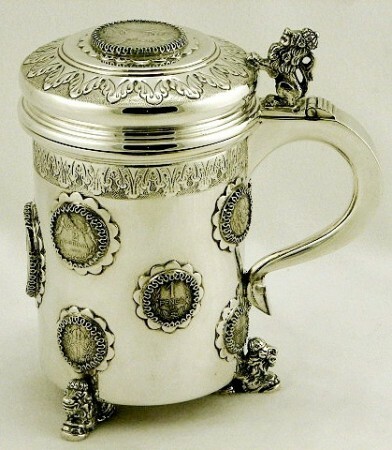 The silversmiths of Hanau specialized in producing reproductions of 16th, 17th and 18th century pieces of silver, mostly of German or French design. They were considered so skilled, that special orders were often made, with copies of original marks, in order to deceive, and experts today often have problems differentiating Hanau copies from the original items. 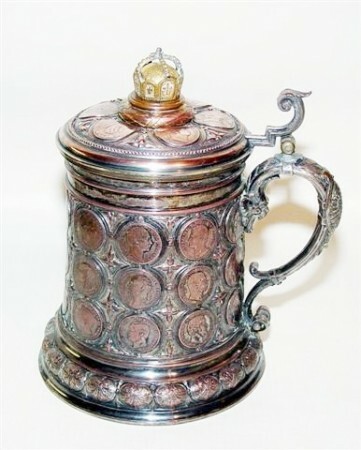 When pieces were legitimately made for the market, different pseudo-marks were used depending on the company and the country from which the piece being copied originated. 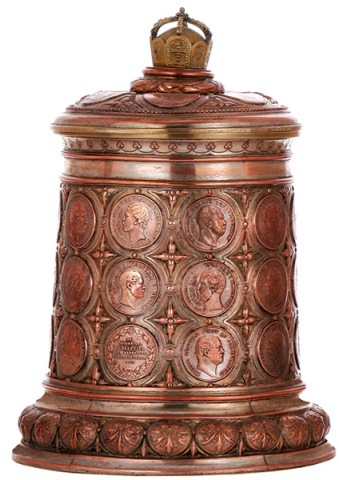 Lid detail of copper medallion on the stein below. 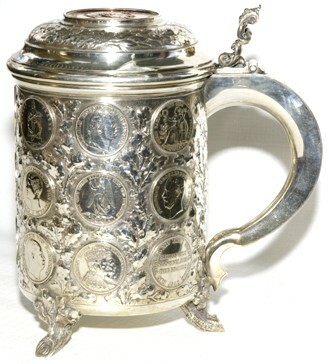 Swedish parcel gilt silver tankard inset with medallions – coins by G. Hammer, Stockholm, 1866 height 9in (22.8cm). Sorry, no info on this gem. I believe it to be of Baltic States origin. 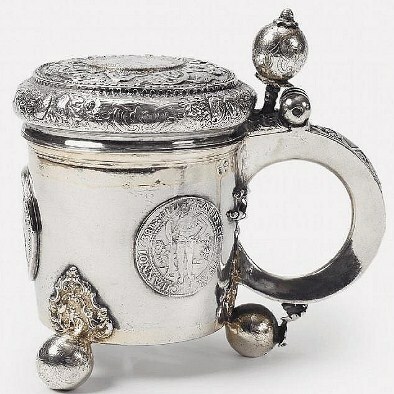 Coined stein – For sale at Christie’s – Dutch, 1700’s, Estimate was 5k Euros. 3-2003. German with a lot of nice work around the coins. Est. was $6K to 8K’s at a J. Vogt’s auction. Munich, Aug. 2002. 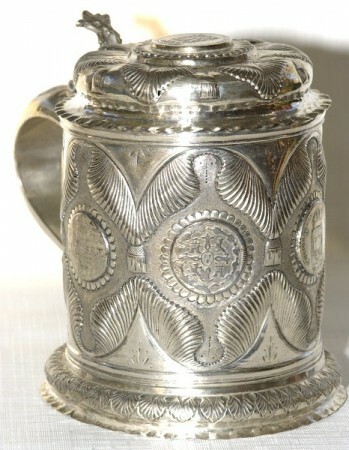 SILVER COIN TANKARD , German , 18th century form, Marked SY & WAGNER, BERLIN, Ca. 1900. This sold at Christies, 2009 for only $3,453,! 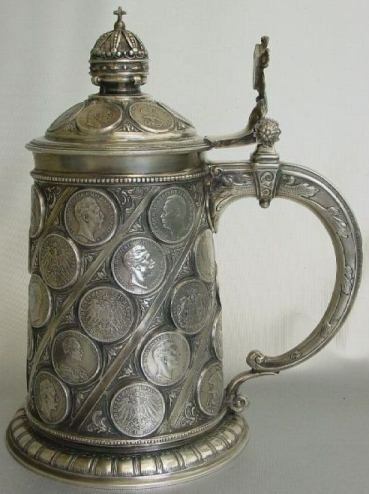 Unusually low price as Sy and Wagner were quite famous silversmith and took over the practice of George Hossauer and became the suppliers to the Prussian Royal Court. 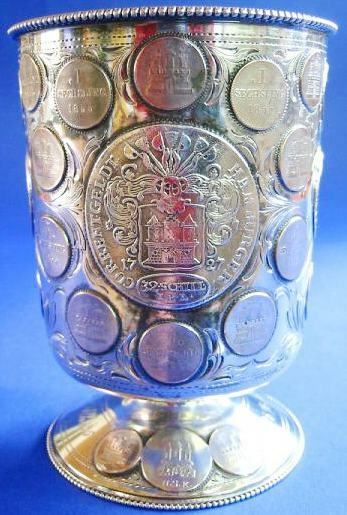 The original .800 silver version of a much copied in silver-plate coin stein. The difference is in the coins that are displayed on the rows.This one sold cheap [I think] in 2007 for about US $4,400.00. And dumb ole me didn’t bid as I thought it would go much much higher! Struck hall mark of Riga with a year letter E for 1768. Sized for a lady. European / Germany [?]. Ca. 1700’s. 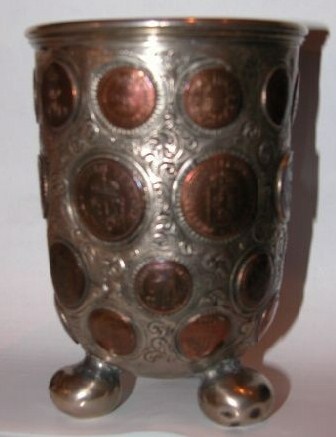 14.4 inch tall 27 coins $8,000 to start bid. 7-2004. A very unusual design. Nice detail work though.